I was wondering where the abundant water came from in those days, too. The words came out of my mouth which told a woman did something to drag the man into, but I forgot what was told then. 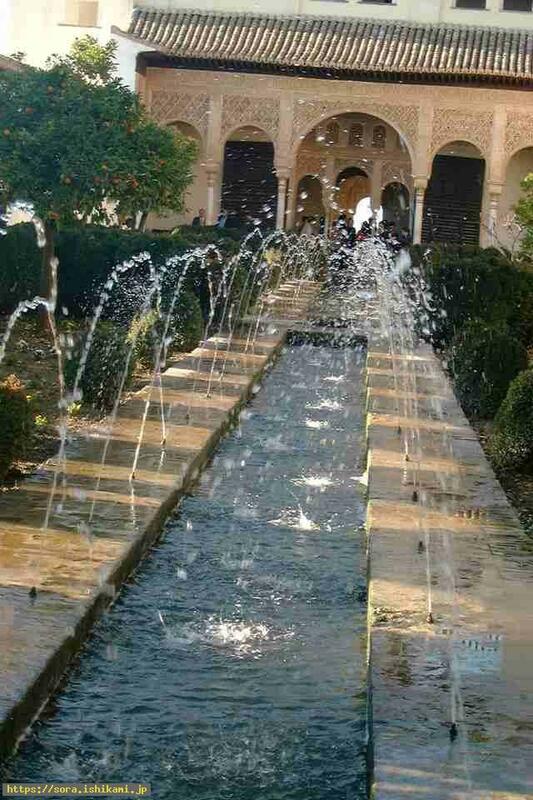 There seems to be Palaces in Alhambra(Spain) and main Palace is Leon Palace and the childen of a lion rules water. The very high trees were impressive. Now I can understand the queen of Jupiter=the queen of Pleiades was ruling there. 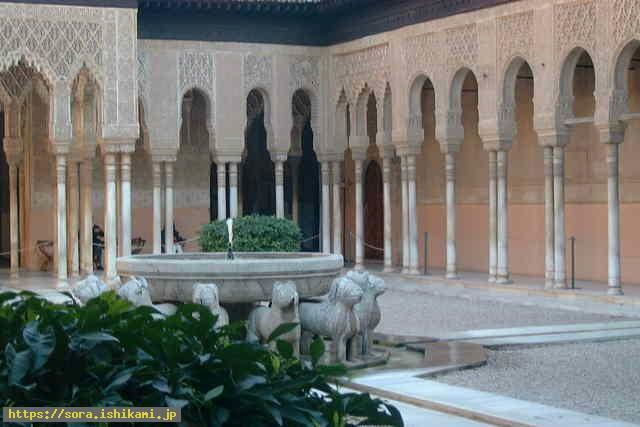 Though outward appearance of Alhambra is very frugal the interior is displayed with surprisingly precise and delicate patterns. 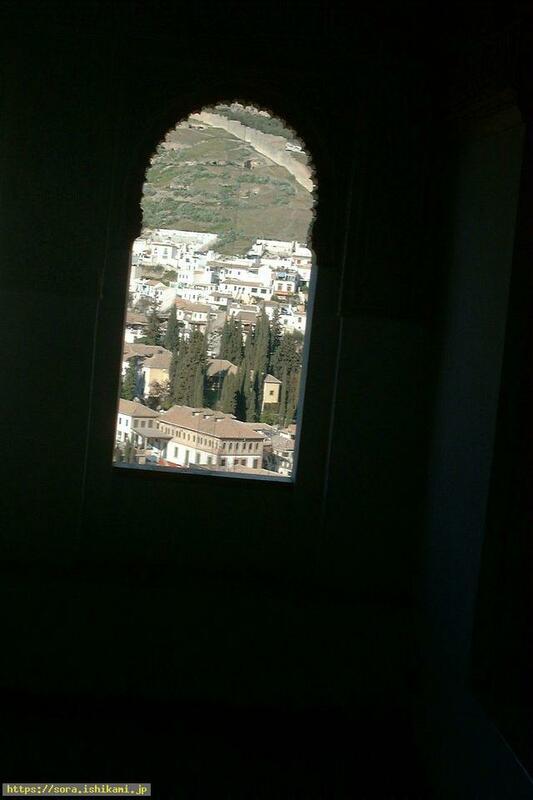 I was much surprised to see it as it was the Islamic buildings which I saw for the first time. The word "god" is made up of the roundish "W" to which side a small semicircle is sticked though it is not shot in this image. Those symbols seem to exist all around. They seem to have named the phenomena in which Minanomono(big groups of atoms) and Minanoko(small groups of atoms) coalesced. They say there are many characters which tell "God is the very victor." 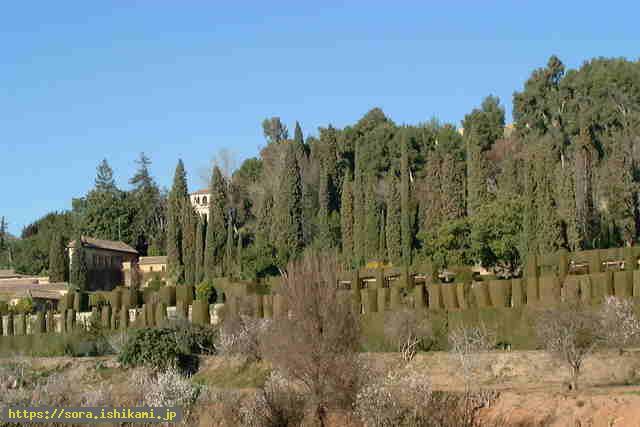 The word "Tanto Monta"="The two are equal" is very important. 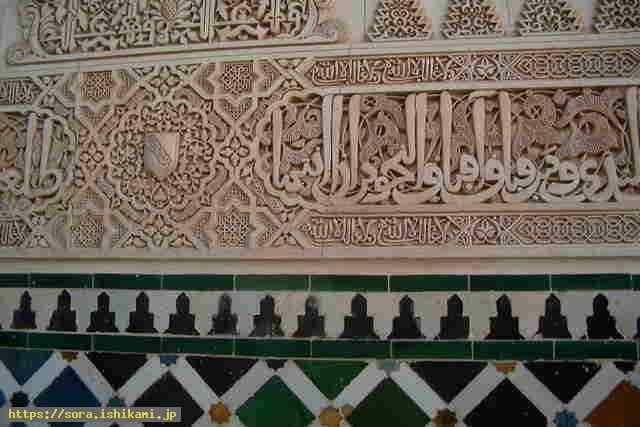 The elongated Arabian character seems to express Minanomono(big groups of atoms) and the small circle seems to express Minanoko(small groups of atoms). Though the color is black, they might be a little evil ones, those continuous figures seem to express Minanoko(small groups of atoms) became the buildings by being connected with one another. This is the very scene which I thought strongly I had to shoot here for some reason. 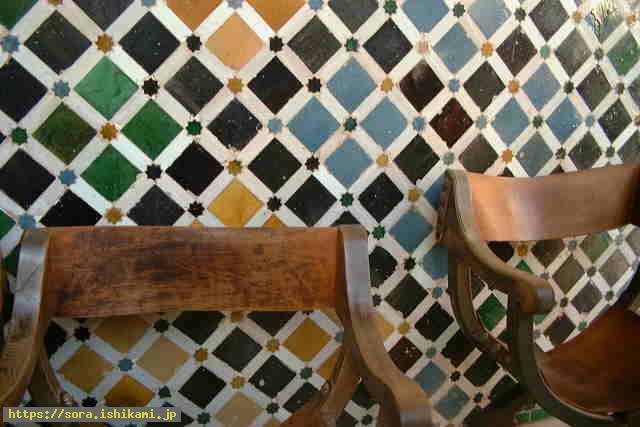 It seemed that the pattern of tiles informed the important thing, though the spirit who were sitting on this chair might call me. I was told the elder of Sirius became the king of Minanoko(small groups of atoms) in order to help weak Minanoko(small groups of atoms). These tiles seem to express those situation. 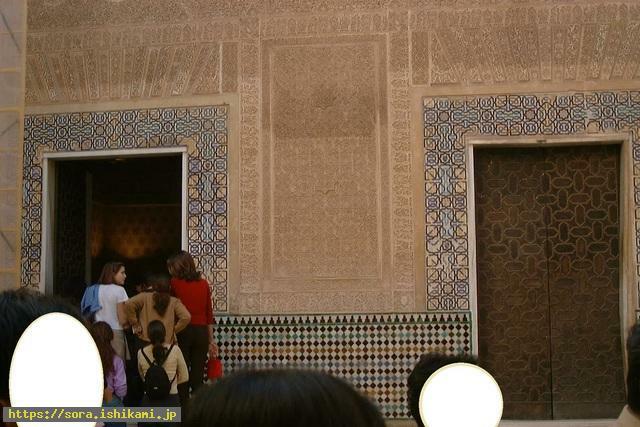 Incidentally other walls are covered with more complex tiles and TV program told each pattern of them requires advanced geometry as each pattern is different from one another. Gypsies live in the cave in the cliff over there and I was told they were going to show their real dancing. Therefore I went to see it by an optional tour. The cave was wider than I had thought. The wall was painted white and the tools like pans, and so on were hanged on the wall. The dancing by Gypsy which I saw at a short distance was overwheling and their thought of regret which had been curbed was transmitted to me keenly. The transmitted feeling was completely different from the showy dancing on the stage and I can recall it vividly even now. There was once the group of people who rebeled against the power and were called "the ground spider" about which I was informed those days. The information became the synchronicity to the thought of regret by Gypsy.